Souza-Baranowski Correctional Center is located in Shirley Massachusetts. 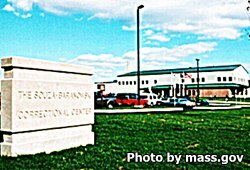 It is a Maximum security prison that houses the most violent and dangerous offenders in Massachusetts. The facility has a current capacity of 1,500 adult males, and is considered one of the most advanced prisons utilizing a variety of technologies to ensure the safety and security of the staff and inmates. There are no keys in this facility, all doors are operated by 43 graphic user interfaces (GUI) which control over 1700 doors, lights, water, gates, alarms, and intercoms. 366 cameras are used and record continuously, and fences with microwave detection systems ensure no inmate can escape. This facility offers programs that include alternatives to violence, parenting courses, substance abuse treatment and relapse prevention. One of the most notable inmates at Souza-Baranowski Correctional Center is former NFL player Aaron Hernandez, who was recently sentenced to life in prison for the murder of Odin Lloyd. Inmates may have up to two adult visitors and up to four visitors total. This means they can have one adult and three children, two adults and two children or any other combination as long as their are no more than 4 visitors total and not more than two adults. Inmates are allowed three visits per week, and only one visit in a day. The day inmates are allowed visits will depend on their housing unit. North Housing unit has visits on Wednesdays 6pm-8:30pm, Fridays 1pm-3:30pm, 6pm-8:30pm, and Sundays 9am-11am. South Housing Unit has visits on Tuesdays 1pm-3:30pm, 6pm-8:30pm, Thursdays 1pm-3:30pm, 6pm-8:30pm, and Saturdays 9am-11am. Anyone who arrives in the final hour of a visiting session will not be given admittance to the facility. This facility rotates the visiting schedule often, because of this you should always contact the institution prior to visiting to verify the schedule has not changed.